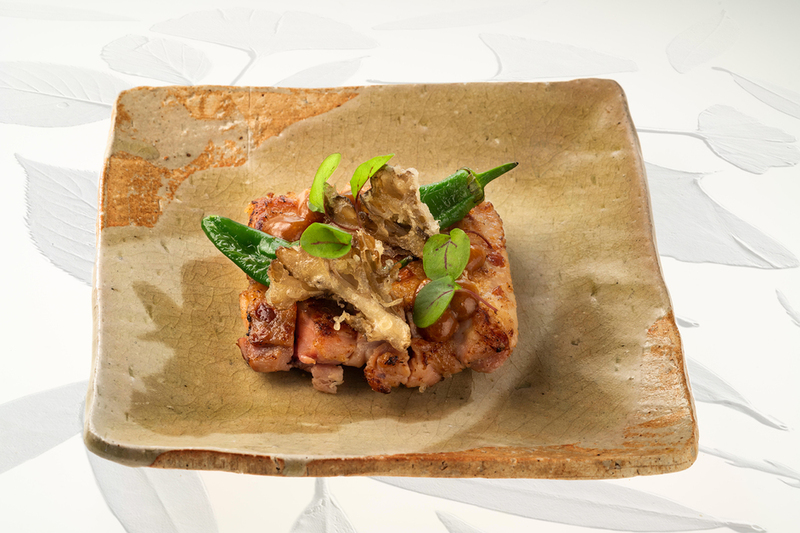 This autumn, Sake no Hana - the upscale Japanese restaurant from the Hakkasan group - is celebrating the arrival of the new season with a special autumn leaf installation and menu. The outside of the restaurant has been decorated with beautifully lit autumnal red, orange and yellow leaves which encase the floor to ceiling glass windows. This allows guests to experience 'momiji-gari', the Japanese tradition of viewing the maple leaves while enjoying authentic Japanese cuisine. Once inside, diners will be able to sit down to a special menu created by head chef Hideki Hiwatashi. The meal commences with a selection of exquisite snacks, including a moreish fried truffle rice ball with seasonal mushrooms and sweet potato and beetroot crisps created to reflect autumn leaves on the ground. Enjoy these while sipping on a wild mushroom and chilli yuzu miso soup before moving on to the main. Choose from pan fried Loch Duart salmon with walnuts and Kyoto miso or chargrilled miso chicken with sesame chilli miso, both of which are cooked to perfection, before feasting on a selection of sushi elegantly served in their very own presentation box. For dessert, there's a hazelnut feuilletine and chocolate parfait served with a maple leaf elegantly constructed from filo pastry. There's also the option of adding a cocktail flight made in partnership with Belvedere vodka and Hennessy Fine de Cognac. At just £40 per person, this is a bargainous yet luxury treat that certainly should not be missed. What are the best dining options near Autumn Leaves at Sake no Hana London? Autumn Leaves at Sake no Hana gyms, sporting activities, health & beauty and fitness. The best pubs near London Autumn Leaves at Sake no Hana. Autumn Leaves at Sake no Hana clubs, bars, cabaret nights, casinos and interesting nightlife. Where to have your meeting, conference, exhibition, private dining or training course near Autumn Leaves at Sake no Hana. From cheap budget places to stay to luxury 5 star hotels see our deals for Sake No Hana hotels, including Le Meridien Piccadilly from 75% off.